We’d love your help. Let us know what’s wrong with this preview of All Things New by Lauren Miller. F Jessa has always felt broken inside, but she’s gotten very good at hiding it. No one at school knows about the panic attacks, the therapy that didn't help, the meds that haven’t worked. But when a severe accident leaves her with a brain injury and visible scars, Jessa’s efforts to convince the world that she’s okay finally crumble—now she looks as shattered as she feels. To ask other readers questions about All Things New, please sign up. I'm working on a YA trigger warning list and I was wondering if this book has any other possible triggers other than anxiety and panic attacks? Trauma? Injuries? Any other mental health issues? Recommends it for: EVERYONE who loves a good book that gives food to the mind. Arc kindly provided by Three Saints Press via NetGalley in exchange for an honest review. In the category: “A book about people with mental health issues”. This story is ver Arc kindly provided by Three Saints Press via NetGalley in exchange for an honest review. This story is very difficult for me to review. I have never read anything similar or came across similar disorders in my everyday life. I solely requested this book because I’ve had my eye on Lauren Miller ever since I’ve read her sci-fi novel “Free to fall” a few years back. This one is very different but I can attest that her writing has only gotten better; it matured like good wine that warms your insides and goes straight to your head. From the first pages of the book is known to the reader that Jessa, a 17 yo girl, is suffering from an anxiety disorder since she was twelve and her parents divorced, and often has panic attacks. After many failed attempts in therapy, inefficient drugs prescriptions and support group meetings she managed to convince herself that if she appears to be well then she is well and she resorted to suppress her condition or ignore it altogether. This behavior resulted to Jessa’s withdrawal from her friends, alienation from her mother and the obsessive attachment to her boyfriend of two years, Wren. But something happens in the beginning of the story that turns Jessa’s world upside down and throws her off the wagon. Now she has to face the fact that she can’t hide what’s happening inside her because she lost her perfect mask. And she can’t cope with this change. Other side effects from her accident add more malfunctions to her already troubled mind and enhance her inability to find her previous balance. “Except I’m not Barbie anymore, not unless they make an Accident Victim Barbie, Brain Injurie Barbie, ew mommy that one is scary-looking, take her away Barbie. As if Barbie can be anything but flawless, anything other than hollow and plastic and perfect. When she stops being that, she stops being Barbie. She’s just a broken ugly doll that nobody wants. For me, these first chapters were very confusing. Jessa’s thoughts are very chaotic, the perception of her surroundings is misconceived and untrustworthy, she’s being rude to her family and the hospital stuff, she questions everything anyone tells her, trying to find hidden meanings behind simple things, always misinterpreting their intentions for the worse. I often caught myself being, instead of sympathetic, exasperated with her behavior, calling “please just get over yourself for one minute, it’s not the end of the world”. But then I thought that having this condition that went unaddressed for so long and was ignored not only from Jessa herself, but from her mother too, totally justified such behavior. And that for Jessa, this probably was the end of the world. The end of her world as she knew it. Not everyone has the strength to believe in his capability to overcome any curve-ball life throws at him. Me, for one, am a very strong and cool headed person - I take that after my dad. I can easily accept facts or situations that are out of my control and seem to adapt to change as easily. And because of these “traits” of my character I often don’t appear to have the necessary empathy for others who don’t share my good fortune in genes, and I might come as cruel or unfeeling. So I want to apologize in advance, if my thoughts and feelings presented in my review, offends anyone who reads it. Believe me, it’s not my intend to hurt anyone’s feelings, it’s just my ignorance in the matter of anxiety and my inability to relate. After the accident, Jessa moves from California to Colorado to live with her dad and start fresh. She enrolls in the local high school, where she meets Hannah and her twin brother Marshall. The three of them soon become friends who spend a lot of time together and though Jessa has put some ground rules for her new life permitting herself to acquire a new boyfriend, she surprisingly finds herself attracted to Marshall’s winning personality. What I noticed early on, was that Jessa interacts with as few people as possible, often hiding herself in secluded places or avoiding socializing at all cost. It had me wondering how it is possible for a young person to have only 3 people in her life. Of course her newly acquired condition “aphantasia” doesn’t help things in her new environment. It makes her question herself all the time and not being able to trust her mind turns her seclusive even more. I didn’t expect to care so much about the other characters in the story, what with being constantly in Jessa’s mind and all, but eventually I cared because Jessa started to care. Hannah is a girl that appears to be strong, self-sufficient, very determined to succeed in her goal, healthy. Marshall, on the other hand, was born with a heart defect which wears on his sleeve and exploits in every opportunity. He likes being pampered all the time but he is more than a spoiled brat. Of course nothing is what appears to be on the surface. I won’t say much more about the plot because I don’t want to spoil it, except that the second half of the book was progressively better, it provided a more concrete insight in Jessa’s internal struggle without being tiring or repetitive, followed by some religious and philosophical questionings and I found the parallel reference to Dorian Gray brilliant. The author’s pen is very strong, her words have impact, they bruise; they’re acidic, they burn; they’re sharp, they cut, leaving behind them bruises, burns and scars to the reader’s soul similar to the ones Jessa pictures in other people’s faces. They are fitting to Jessa’s heightened emotions and her soul’s turmoil. But, at the same time, the author’s approach on the subject remains humane with a sensitivity that moved me very much. The change developed in Jessa’s mind after the realization that she’s not alone, both in her life and her mental struggle, was tangible and liberating. “And it strikes me in this moment that Marshall was wrong. It’s not that we’re all broken inside. It’s that we’re not. Brokenness is just like beauty; it’s something we wear and carry, and if we let it define us, it will. But we are not our beauty or our brokenness, because souls are not made of beauty or brokenness. Souls are made of something permanent. All in all, a very important story, told in a unique, non-didactic way, that probes the reader to ponder over further. I would recommend it to EVERYONE who loves a good book that gives food to the mind. “We see what we want to see, what we expect to see, instead of what's really there. I don't think we do it on purpose, most of the time. We just get kind of stuck. I received an ARC of this through Netgalley in exchange for an honest review. Thanks to Three Saints Press for the opportunity! This is one of the best depections of anxiety that I have ever read. Jessa’s thoughts are invasive and controlling-- physically represented by lower-case italics that interject her conversations and several daily activities. All too often, YA treats mental illeness like something that can be ‘cured.’ Like throwing the two love interests together will ‘fix’ them and everyone will be magically happy. Not here. Jessa previously tried to move past her struggles by throwing herself into her relationship, sacrifcing part of her identity in doing so. This was a really strong plot point, and handled very well. I really enjoyed most of the characters! Marshall is fun, with creative outlooks on life. Struggling with a heart-condition since birth (that left him without symptoms) he has a completely different definition of what it means to be ‘sick” and it lead to interesting discussions. Marshall’s sister, Hannah, was also a very interesting character. Devoted entirely to her piano studies, she quickly has to reevaluate her goals and what she’s willing to do to get there. I also appreciated the large amount of focus on Jessa/Hannah's friendship, instead of just focusing on Jessa’s romantic relationship. Suddenly everything turned into a Hallmark special? With all this talk of souls and miracles and everything magically working out? It just felt like a cop-out to me, and the heavily spiritual themes overshadowed the previous character development. Jessa no longer had to find strength inside herself, as the universe handled things for her. With so many interesting characters and dynamics, I don’t understand why Jessa’s relationship with her mother was completely glossed over? There are references to Jessa not getting along with her new stepfamily, and wishing she belonged, but nothing where she ever tries to work this out. It almost seemed an easy way to write her mother and old life out? Jessa has managed to cover-up her panic and anxiety disorder with her beauty, fake smiles, and a handsome, popular boyfriend. When that all comes crashing down around her, changing Jessa's life for the worse and for the better. When a nearly-fatal car accident leaves Jessa's face scarred and her brain damaged her anxiety and panic become impossible to hide. Relocated to Colorado with her dad, Jessa finds that though she cannot stand the idea of seeing her face, others ARC provided via Netgalley. I received this E-ARC via Netgalley and the publisher in exchange for an honest review. I had heard about this book through GR, found it interesting and requested it. Unfortunately I didn't like it. I didn't like the MC. She avoided everything to points of stupidity. She was rude to her dad because he was actually trying to get involved in her and help her. She treated her friends ten times better than her own father. Who was actually trying to be a good dad. The romance came out of nowhere. Yes the guy was nice to her and she liked him. But I didn't feel the attraction and didn't even know the MC liked him that way. DNF at just over 30%, I'm not going to force myself to read this anymore. As a person who deals with Anxiety in day to day life I just couldn't read anymore. I know that everyone deals with things differently but this really isn't for me. I started reading this on the 15th of July and I just can't do it anymore. Thank you to NetGalley and the publishers for providing me with a copy in exchange for an honest review. “From the author of Parallel and Free to Fall comes a novel about how it feels to be broken and what it means to be real. Seventeen-year-old Jessa Gray has always felt broken inside, but she’s gotten very good at hiding it. No one at school knows about the panic attacks, the therapy that didn’t help, the meds that haven’t worked. But when a severe accident leaves her with a brain injury and not Thank you to NetGalley and the publishers for providing me with a copy in exchange for an honest review. Seventeen-year-old Jessa Gray has always felt broken inside, but she’s gotten very good at hiding it. No one at school knows about the panic attacks, the therapy that didn’t help, the meds that haven’t worked. But when a severe accident leaves her with a brain injury and noticeable scars, Jessa’s efforts to convince the world that she’s okay finally crumble—now she looks as shattered as she feels. Fleeing from her old life in Los Angeles, Jessa moves to Colorado to live with her dad, but her anxiety only gets worse in the wake of the accident. That is, until she meets Marshall, a boy with a heart defect whose kindness and generous spirit slowly draw Jessa out of her walled-off shell and into the broken, beautiful, real world—a place where souls get hurt just as badly as bodies, and we all need each other to heal. You would think after hating most YA contemporary books I read, I would stop but here we are again. Seeing how the book started, I thought that this was going to be something that I was going to like, but after the accident happened it became one of these ‘coming of age’ stories that I hate. My main issue is that nothing happens. At all. The main event happened within the first 10% and honestly, there isn’t anything else to write home about. I didn’t like the characters and even though I could identify with the panic attacks and anxiety Jessa had, she annoyed me more than anything. I also found the romance between her and Marshell cringey and uncomfortable to read about. The writing did flow well and I got through it very quickly and that may have been the only aspect that I enjoyed. This just isn’t the type of book that I enjoy and I should probably give up trying to read ones that fall into this genre. All Things New is the story of Jessa, a girl who has struggled for years with panic attacks and anxiety. Jessa has pushed all of her struggles and suffering down inside of her, shielding herself from the world and from any prying eyes by attempting to act as though everything is always fine. After a car accident turns her life even more upside down, Jessa moves to a new school where she meets a girl named Hannah and Hannah’s twin brother, Marshall. As Jessa starts to le ARC provided by NetGalley. After a car accident turns her life even more upside down, Jessa moves to a new school where she meets a girl named Hannah and Hannah’s twin brother, Marshall. As Jessa starts to let her new friends into her life, she begins to realize the importance of being open and honest about her struggles as well as reaching out to others about their own. All Things New is a story about suffering, hidden struggles, despair, loneliness, and the hope that can be found in the midst of our darkest times. I found this story to be moving, engaging, and hopeful. So many stories that could be comparably similar to this type of YA fiction end in a less than hopeful way, so All Things New was refreshing. I think anyone could have some sort of a connection with Jessa – I know I see a lot of myself in her. Marshall is one of the more memorable characters in the books I’ve read recently – he’s sarcastic, honest, kind, and hilarious. Not only is the story well written, but the messages and themes are key for today’ world. It is a story that I believe will help many people – from adults to teens - to see what they’ve been avoiding and hiding and where there might be healing from those things in the sharing of them with others. This review has been hidden because it contains spoilers. To view it, click here. UPDATE (05.03): After re-reading the ending I stand by my first puntuation of the book. Even more so, to be honest. The book was more or less good until I realized I was being fed some kind of christian psycho babble... so... angels? And the actual psychologist and psychiatrists are the bad guys? No. Thanks but no. I dislike this kind of bull A LOT. ADDED NOTIFICATION (27.01.17): Since posting my review I was approached by the publisher and the author explaining that the galley I was offered was UPDATE (05.03): After re-reading the ending I stand by my first puntuation of the book. Even more so, to be honest. The book was more or less good until I realized I was being fed some kind of christian psycho babble... so... angels? And the actual psychologist and psychiatrists are the bad guys? No. Thanks but no. I dislike this kind of bull A LOT. ADDED NOTIFICATION (27.01.17): Since posting my review I was approached by the publisher and the author explaining that the galley I was offered was a corrupted file which had chunks of text missing which affected the comprehension of the text and so on. I have been offered a correct one and I have said I will re-read the ending when I finish the book I am reading it so I can see if my opinion of the book changes. I'll keep yopu posted about it. I was enjoying the book so much, following the life of our main character who suffers panic attacks and is recovering from the aftermath of a car accident which has left her with a face full of scars and the "ability" of seeing scars and bruises on other people faces. Why is this happening to her? After leaving her mother's home and moving with his father she meets a sister and brother who turn out to be a new friend and boyfriend to her, and it was nice to see the beginning of those relationships, althought the one with Hannah, the girl was a bit on the weird side because she began to be a bit... rude? Oh my. Yikes. I wish I could say more about this book but the thing is, I can’t remember that much anymore despite finishing it recently. The plot revolves around Jessica’s anxiety paired with her hallucinations due to a brain injury obtained from a car crash. She moves away from her mom and lives with her Dad. The writing wasn’t anything special. It was very mundane and didn’t stand out. This was bad because it didn’t hold my interest. The premise was good but the writing failed to execute. The r Oh my. Yikes. I wish I could say more about this book but the thing is, I can’t remember that much anymore despite finishing it recently. The plot revolves around Jessica’s anxiety paired with her hallucinations due to a brain injury obtained from a car crash. She moves away from her mom and lives with her Dad. The romance also felt insta-lovey. Really reminded me of TFIOS (warning: I dislike that book) so that’s part of why I didn’t seem to catch on. I love this author as she has the ability to dress up challenging concepts and parade them in front of your eyes via intriguing story arc. Parallel is one of my favourite young adult sci-fi books, so I was pumped to read All Things New by Lauren Miller. Ultimately, I did enjoy this book, a lot. However I thought it lagged at the beginning, and then picked up majorly in the second half. It is a very character driven book, so luckily I liked Jessa from page one. She has an accident at the start of the book, which leaves her badly scarred. Jessa also has an anxiety disorder, and the knock-on consequences of the accident sends it in to overdrive for her. I’ve never had to cope with an anxiety disorder, but I feel that I learnt a lot from reading the book. I now understand just how huge it is, and how it impacts on everything. Her thoughts are dark and deep, but there is also a very hopeful outlook which really helped me to process everything. So thumbs up for what felt like a very authentic depiction. My flat-out favourite thing though was the ideas and thoughts that are hashed out during the book. Like a surreal discussion about Dorian Gray, or stimulating thoughts on philosophy. It was mind-boggling and very cool. Overall a very original and thought-provoking book. My only complaint is that the start was slow but once I got stuck in, I was hooked. There is a little bit of a religious theme which I normally hate, but it wasn’t forced down your throat and I was fine with it. Also there is a romance, it wasn't the centre focus of the book, but it was sweet and very nicely done. Who should read All Things New by Lauren Miller? I’d recommend this to you if you want to read an encouraging and realistic-feeling book about a teenager with anxiety. I’d also recommend it to fans of issue focused ya contemporary books, especially if you enjoy authors such as Kasie West or Jessi Kirby. I have been waiting 3 years for this book. I mean not this book in particularly, but just another book by Lauren Miller. I’m a Lauren Miller fangirl. I know it, she knows it, people that follow my reading know it. Ever since I read Parallel for the first time 4 years ago I have been a champion of all books Lauren Miller. I will tell anyone and everyone to read her books. With that in mind imagine how happy I was when I learned about All Things New. I was warned that it was very different from Miller’s other two books and I may not love it as much. Well guess what? That warning was wrong. All Things New was AMAZING! It was a book I needed without knowing I needed it. All Things New is about Jessa, a quiet 17 year-old that has been plagued by anxiety for many years. She has done everything in her power to hide the panic attacks and fears she has and she does so successfully everything changes. Jessa gets in a terrible accident and all of a sudden she sees scars and wounds on people. The thing about these scars and wounds? They don’t exist. They are projections in Jessa mind. When Jessa moves in with her dad and starts a new life, meeting adorable Marshall in the process, she must find answers to why she is seeing things and figure out how to heal herself in the process. This book! I seriously loved this book. What I loved most about All Things New, Marshall aside (we will get to him and Jessa later), is the message I found in it through Jessa and the scars she was seeing. The thing is, we all hide scars. We all have things that hurt us or weigh on us that people just don’t know about in everyday life. Jessa was rare and she was able to see those struggles through the manifestation she developed. She may have been seeing wounds on the outside, but really she was seeing what was happening on the inside, the hurt people were feeling in everyday life. That right there is what made All Things New so amazing and important. Jessa was hurt and angry buy what happened and how her life was and this “power” showed her she was not alone. But she really wasn’t alone. There was Marshall. Oh adorable, lovable, genuine Marshall. He is probably one of the best characters I have read in a long time. He was insanely perfect in his flawed way and he was exactly what Jessa needed. He brought a humor out that was timed perfectly and he was just a great guy. He didn’t make Jessa feel anything she wasn’t ready to feel. He was just there for her. He listened to her and they formed a bond. It was all 100% swoon-worthy. Brilliant. Absolutely brilliant. This book was amazing, the amount of quotes I highlighted throughout the book was ridiculous because they all spoke to me so much. I can imagine many people will criticize this book as it is based around a mental disorder, and no one every agrees about the symptoms, improvement rates or anything else related to it. I believe this is because everyone who has experienced this or knows someone who has, experiences it differently. So saying that, I completely related to Jessa. Not in the sense of having a car accident and such but the panic and anxiety are something that are very familiar to me. I think Lauren did a great job at putting Jessa's feelings and thoughts into words when even I struggle to explain how I feel to people at times. I do personally criticize the fact that it is never explained exactly where Jessa's hallucinations come from as this is normally a trait of psychosis and associated with for example, schizophrenia. But for the sake of the book I assumed and went along with the idea of it being a coping mechanism and/or PTSD and/or result of brain damage. Jessa is a very deep and interesting character. With it being written from her point of view, we get an insight into her mental process, her emotions and her fears. After the accident her fears are realistic, they feel real to me, I can imagine I would feel like that. And even though it is a book, I kept wishing for her to get through it and feel better. When Marshall came into the story I knew this was going to happen. A lot of people will say, oh love can't heal mental disorders, but I believe it partially can. I believe it can make the person feel more safe and secure and feel better than they did previously. It might not be something that can completely heal, but it can get better, and this is what Marshall did. Eye-opening and endearing. I really liked this book a lot. Anxiety issues are front and center, but there is also friendship, family, spirituality, romance and laughter. Marshall was so entertaining and added so much hope and humor. I wish all humans could be as lovely as he is! Highly recommend. So I HATE to do this and wished it never happened again but in had to make this my 2nd DNF 🙊🙊🙊🙈🙈🙈 I decided to pick this up on my kindle after so long and I got it from netgalley as an ARC for an honest review. I'll admit I was actually bored and annoyed with the italicized thoughts Jessa had because the i's were lowercase and there were no punctuation marks and again that was annoying. Characters thoughts like that should ALWAYS be written like any other sentence in a book in my opinion. But whether you want it italicized or not, fine. But don't start putting and making it all lower cased and no punctuation marks. Jessa was also annoying in my opinion but I did at least meet Marshall who was nice to her. And I actually don't know who was more annoying: Hannah (Marshall's twin sister who becomes Jessa's new friend) or Jessa herself. Overall, I was seriously bored and then it got weird for me and too wordy and descriptions etc. so I had to DNF my second book sadly. Despite Marshall being the only decent thing in here tbh. But it some liked it kudos and glad you did! But I can see why not many didn't like this or rated it so low. I just finished reading the book and I don’t know where to start because everything about this book is freaking awesome! I first came across this book on NetGalley. The cover was what draws me to the book at first and then I read the synopsis and voila, I clicked send to Kindle. The story focused on Jessa, who always hid her feelings and that includes hiding her panic attacks. She was diagnosed with General Anxiety Disorder after her parents’ divorce. She didn’t have many friends and her only companion was her boyfriend, Wren. Things happened one night that upset her, which lead to a severe car accident that left Jessa with scars and hallucination. She moves to Colorado to live with her dad and that’s really when the story begins. She started to hang out with Hannah, the girl who was appointed to show her around on the first day of school. Jessa also got to meet Hannah’s twin brother, Marshall, who didn’t treat her differently and somehow able to make Jessa feels comfortable around him. Ever since her accident, she started to see bruises and wounds when she looked at other people, even when she thought she was getting better. She started to think that she maybe had the ability to see what’s real in a person. From there, we got to see Jessa’s journey on healing with the help of her dad and friends. We saw how talking to these new people really brought a different perspective for her and Jessa started to see herself differently at a certain point. She decided to get help and fought hard to get better. She learned to believe in herself and accepted who she was. I really really like Jessa. There were moments when I was frustrated with her in the beginning but I really like how her character developed. She doesn’t make excuses for herself and I admire that. I feel like I haven’t seen a lot of super honest heroine in YA before. My favourite character in the book is definitely Marshall. He is extremely likeable and sweet. He tried to understand Jessa without crowding her. He wanted her to open up and to stop hiding her feelings because he knew how much it affected her. Do you see what I mean? Probably one of the best YA book boyfriend I’ve ever read. He’s also very funny and doesn’t always take things seriously. Then we have Marshall’s twin sister, Hannah. She first met Jessa when she was appointed to show Jessa around. Throughout the book, Hannah was preparing for her piano audition to enter a prestigious music school. She was so focused on her audition that she doesn’t care much about anything else, even about Marshall’s heart condition. Often times, Jessa finds herself questioning why Hannah didn’t seem to care much about Marshall, even when she is dead worried about him. Hannah also dealt with her own issue and I have to say that I like the Hannah at the end of the book more. Because like Jessa, I sometimes found Hannah a bit selfish even though I can understand why. I also love Jessa’s dad! He left when Jessa was younger and that cause Jessa’s anxiety. You can tell that he cared a lot about her and felt guilty. I like how he tried his best to help Jessa open up and got better even if Jessa chose not to. One of my favourite scenes in the book was when he told Jessa why he left. Although it seems like the one in the copy I got is cut because it jumps straight to a conversation between Jessa and Marshall. Or maybe it supposed to be that way but there was no divider between the two lines so that made me wonder if that’s an error. The only thing I felt a little down about is the ending of the book. It felt a little rush to me. I wish we got to see more of what happened next to Jessa, Marshall, and Hannah. All Things New for me has become one of my favourite YA books. The biggest takeaway for me after reading the book is about acceptance and believing in oneself. Especially when it comes to dealing with the things we are scared of; that we don’t have to be ashamed of ourselves, of having what other people might think of as a weakness. This was the first book of Lauren Miller that I read and you bet, I will read her other books because she definitely has ways with words. While reading, I found myself tearing up after reading certain lines in the book because of how true they are and no book I’ve read so far has been able to capture those feelings in words. The depiction of anxiety in this book felt so real. Maybe it’s because of how detailed Jessa’s inner thoughts are being written in the book. The words spoken by the others felt genuine and almost felt like they are talking to me instead of the characters in the book (that’s what made me cry reading them). So, thank you, Lauren Miller, for writing such a beautiful and uplifting book! Heart-felt. Humorous. Hopeful. And Marshall was my favorite! An enthralling and vital YA read—boldly tackling issues of mental and relational health within a compelling narrative. Jessa Gray has been broken on the inside ever since her parent’s divorce, when her father moved several states away and her mother quickly remarried. While her mother was busy with her new family, Jessa fell into a crippling anxiety disorder that cost her all social relationships—all except for the boyfriend crutch she thought she could lean on. When that crutch fails and she ends up in a horrific car accident, her brokenness suddenly extends to a newly scarred face and a brain injury that induces something called aphantasia(mind’s-eye blindness.) Along with something else… something she’s afraid might mean she’s crazy. So when her father offers to move her from California to Colorado for a fresh start, Jessa accepts—unable and unwilling to return to the life she’s lost. I readily admit that first-person present-tense is among my least-favorite in terms of storytelling methods. And yet, I can't recall the last time a contemporary flew by so well for me. Almost 80 pages in, I felt like I’d just started. The content is weighty without feeling weighed down (which is quite the accomplishment.) And while Jessa’s looping introspection and avoidance is often frustrating, it’s also believable. I wouldn't call it fast-paced, so much as fluid and effortless reading. I hadn't heard of aphantasia before this book. Which was surprising, given my medical background. It was also a welcome learning opportunity. Aphantasia was first written about over a hundred years ago, and apparently exists in 2% of the population—meaning 1 in 50 people may experience it, temporarily or permanently. (Many don't even realize they have it, if they acquired in congenitally.) This reader found it both fascinating and kind of horrible; the idea of being able to recognize people and things in front of you, but not being able to picture them--or picture anything at all--when you close your eyes. Marshall was my favorite part of this story. Flying in the chiseled face of every brooding alpha-male bad-boy stereotype, Marshall is a charmingly upbeat and extroverted love interest. He’s funny, sharp-witted, keenly observant, and prefers sitting at the autism-spectrum table to mingling with his more mundane peers. He’s also a somewhat concerning heart patient, who has perhaps allowed physical limitations too much license in his identity. I adored him—and his reliable banter with all those around him. "I can't believe you're shaming me right now. I'm very sensitive about my use of cool vernacular." "Then we're good. Because you haven't used any." I flash a grin. All Things New encompasses themes of heartbreak, empathy, invisible illnesses, familial forgiveness, positive and negative coping mechanisms, neuro-atypical understanding, and above all, hope. I can honestly say I look forward to getting it into the hands of my goddaughters. “Brokenness is just like beauty; it's something we wear and carry, and if we let it define us, it will. But we are not our beauty or our brokenness, because souls are not made of beauty or brokenness. Souls are made of something permanent. Jessa has always covert-up her anxiety and panic with her beauty, her fake smiles and relaying on her handsome and popular boyfriend. Ever since her father and mother split Jessa is dealing with anxiety and panic attacks. She lost her friends and felt alone, but when Wren come into play she clings to him like her is her lifeboat. When that dream crashes on night her whole world is collapsing. She is in a accident that distroys her left side of her face and is left with scars. Now she no longer can rely on her looks to hide her panic inside. Jessa for me was a beautiful spokes person for people with anxiety and panic attacks. For myself - someone who is strungling with it myself - it felt very real and was really relatable. The panic that comes at times that you don't expect it and the anxiety that is always there, but you can't talk about it because you know most of the times that it doens't make sence. I felt her pain when she was trying to fit in at her new school, when she wanted to do something about her panic and anxiety but didn't know how to. It was so real and im tankfull for that to Laura Miller . She has written such a beautiful real character, she is flawed, imperfect and real. Some people will not understand and mayby don't agree but i get why she acted the way she did towards her dad. She couldn't let him in, she couldn't share the pain and fear she felt towards him. She wanted to be close to him again but everything was to complicated. Because of the anxiety she acted different than who she was - i know from experience. Also the message the book gave about seeing people for who they are, scared, bruised and thorn up inside, but still beautifull on the outside. You don't always see someones pain on the outside, scares on the soul are just as bad as those on you skin. They way it was introduced into the story was very smart. And i find it very refressing that this book didn't turn into a sappy love story when it was about so much more. I loved it for that. It kind of brings awareness to the topic in some sort of way. I have seen mixed reviews on this book, and mayby because i know what Jessa is going through that this book meant more to me than some it is that i liked it so much. For people who are going through the same read this book. Lesson learned: Never judge a freebie book based on its "freebie" status! So not only did I receive a copy of this book for free from the publisher in exchange for an honest review, it was also a 'download now' free copy, meaning that I didn't have to be approved or anything in order to read it. I usually equate these books--in my mind--to the freebies of the ARC world. That aside, I thought that this book was a really good read and I very much enjoyed it. Jessa has suffered from an anxiety diso Lesson learned: Never judge a freebie book based on its "freebie" status! So not only did I receive a copy of this book for free from the publisher in exchange for an honest review, it was also a 'download now' free copy, meaning that I didn't have to be approved or anything in order to read it. I usually equate these books--in my mind--to the freebies of the ARC world. That aside, I thought that this book was a really good read and I very much enjoyed it. Jessa has suffered from an anxiety disorder since her father left her mother when she was just twelve years old. Now, at 17, she is barely getting through school living with her mom in L.A. and clinging to her prepster boyfriend. Until one night at a party changes everything. A near-fatal car accident leaves Jessa's face scar-ridden, and her brain nearly as damaged, she decides to leave everything behind to live with her dad in Colorado. Here she meets new people, reconciles with her father, and learns about the true measure of healing both inside and out. Such a beautiful story with a really great meaning. After finding her current boyfriend cheating, Jessa decides to drive herself home. When a driver hits Jessica and sends her to the hospital, the last thing that Jessa has is gone. With new scars on her face, Jessa has lost the one thing she's been able to hold on to, her beauty. Now ugly and broken on the inside after her parents divorce, Jessa moves away from LA to Colorado with her dad. Can she find a way to repair the damages that have been Such a beautiful story with a really great meaning. After finding her current boyfriend cheating, Jessa decides to drive herself home. When a driver hits Jessica and sends her to the hospital, the last thing that Jessa has is gone. With new scars on her face, Jessa has lost the one thing she's been able to hold on to, her beauty. Now ugly and broken on the inside after her parents divorce, Jessa moves away from LA to Colorado with her dad. Can she find a way to repair the damages that have been with her for such a long time. I truly liked Jessa's character. While she is broken and sad, she doesn't necessarily shut everything down and is open to getting better and listening to other people and their opinion. While she may not see it, she is very smart and kind. I really loved her. The side story to this book is about Hannah and Marshall, a set of twins both going through their own pain, which end up becoming best friends/boyfriend to Jessa. I honestly enjoyed Hannah's story the most and was constantly waiting to see what happens to her. While I loved all the characters, and I was constantly excited to see what happens to them, there wasn't much action or intensity to this story. There wasn't any crazy plot twist or any intense action that kept the reader engaged. I feel like if you don't like the main characters from the beginning then you wont enjoy the story. Overall, I enjoyed the story and the characters, but I would have liked it much more if the story wasn't so predictable. I would still highly recommend this book to anyone, especially if you love stories about mental illnesses and/or guardian angels. "...perfect for fans of All the Bright Places and The Fault In Our Stars". Having noticed these words in the blurb for 'All Things New' by Lauren Miller I felt helpless to resist. Afterall those two books are amongst my favourite YA titles. What a wonderful discovery it was to find out the blurb was correct. All Things New was an excellent book. It brought to the forefront the debilitating symptoms and effects of anxiety and other important mental health issues all of which were handled with the utmost care. Lauren Millers writing was extraordinarily realistic in her portrayal of experiencing a traumatic head injury. 17 year old Jessa has been involved in a serious car accident and is left feeling fog headed. Everything is too bright, sounds are too loud, the dizziness, unsteadiness on her feet, clutching at memories or words that are there but just out of reach, all of this resonated with me from personal experience. Thankfully I have not experienced anxiety, or the other psychological issues which were front and centre in this book yet I had every faith that Ms Millers portrayal of these were equally realistic. Jessa has suffered anxiety for some years now and her treatment, therapy & medication have all been unsuccessful. Her coping strategy has been to suppress her feelings, practice avoidance and rely upon her beautiful exterior to hide the ugliness and damage she feels inside. Now with a heavily scarred face, her facade is broken and her anxiety is taking the upper hand. After a terrifying change of school and with the help of her newfound friends Jessa learns some valuable lessons about facing up to her fears, about learning to trust, the importance of friendship, the life changing benefits of deciding to make behavioural changes, and of seeking and accepting help. Lauren Millar delivered all of that without making her book sound or feel preachy. This new-to-me author has delivered what felt like a very important coming of age story. All themes were handled delicately and worked beautifully imo. I'm particularly interested in hearing thoughts from others, especially those who have experienced anxiety up close and personal, to understand if Lauren Millers portrayals were as realistic as they felt. All Things New follows the story of Jessa, our protagonist, as she attempts to come to terms with the after- effects of a terrifying accident, and the physical and mental scars left behind. Long story short, I loved this book. It's so sensitively done, it's hard not to and I believe the comparisons with The Fault in Our Stars and All the Bright Place are justified. It tackles several very difficult subjects carefully and beautifully, weaving a sometimes heart-breaking yet hopeful tale that's par All Things New follows the story of Jessa, our protagonist, as she attempts to come to terms with the after- effects of a terrifying accident, and the physical and mental scars left behind. Long story short, I loved this book. It's so sensitively done, it's hard not to and I believe the comparisons with The Fault in Our Stars and All the Bright Place are justified. It tackles several very difficult subjects carefully and beautifully, weaving a sometimes heart-breaking yet hopeful tale that's part love-story part coming-of-age. I'd recommend this to everyone. It let me down and I really wanted to like it more.. In his novel, The Picture of Dorian Gray, Oscar Wilde suggests that man's attempt to separate his soul from his body will eventually lead to the loss of both.Dorian Gray thought that hiding his true self from the world would set him free, but it actually did the opposite. It made him a prisoner to a lie; a lie that drove him deeper and deeper into darkness and ultimately destroyed him. More than anything, it seems to me now he was an insecure person, unsure of his own value beyond his appearance. And it strikes me now, that I probably would've made Dorian's trade, if I believed it were possible to put my true self on a painting I could hide from the world. But I didn't have a magical canvas, so I tried burying the truth inside me instead, building little mental boxes to hold the things I didn't want anyone to see. The all-consuming panic. The swirling thoughts. The sinking shame. The fear that I'm not good enough, have never been good enough, that if anyone really knew me, they'd leave. True words, that dive deep into you and you realize that everytime you said ''I'm ok'' as an answer to that person that has asked you if you are ok, but you actually weren't makes us liars as we bury those truths underneath the surface and put on a mask and pretend that everything is OK and we are as well. That everyone is struggling with something and everyone is pretending otherwise. I really did like these messages and the truthfulness in them. After the accident she has she moved to live with her father in Colorado, were she befriends Hannah and Marshal; twins. My favourite character is definitely Marshal and I wanted to see more of him, he is funny, optimistic and gives you that fresh air you need after all the heaviness in this book, regardless of his own condition he always looks at the bright side. One of the things that did not work out for me in this book was that the characters had something to cope with. I mean, why?? It just made the whole book wayy too HEAVY and how can I say I wanted some light into it more MARSHAL!! Rarely does a book touch both the heart and the mind, and be so entertaining and profound at the same time. ALL THINGS NEW has everything I love for in a story -- love, mystery, the mystical, a real understanding of the stress and anxiety we all feel, and honest and real insight on what it means to be human. I view the world somehow differently having read All Things New and, like Jessa, had a chance to glimpse behind the veil to the reality that we all share. I finished Lauren Miller's All Things New all the way back in June of 2017; however, it took me until now (2018) to write my review. It didn't take me so long to write it because I didn't like the book - the truth is far from that actually. It took me so long because I just didn't know what to say. Simply, All Things New left me 100% tongue tied. It's a quiet contemporary YA. It focus on handling anxiety, overcoming the pains of the past, and finding a home in a new place. It's character driven I finished Lauren Miller's All Things New all the way back in June of 2017; however, it took me until now (2018) to write my review. It didn't take me so long to write it because I didn't like the book - the truth is far from that actually. It took me so long because I just didn't know what to say. Simply, All Things New left me 100% tongue tied. It's a quiet contemporary YA. It focus on handling anxiety, overcoming the pains of the past, and finding a home in a new place. It's character driven rather than action driven, and it worked beautifully. I flew through it at rapid speed. I needed to know if Jessa would find her home, if she would allow her dad to be active in her life, if she would open herself up to making friends. Jessa's had a hard year, and all I wanted was for it to get easier for her, more manageable. Plus I have to admit: I raced through it because I also needed more of Marshall, a sweet, happy-go-lucky boy Jessa befriends. There's one aspect that I could see holding people back from reading this, however, and that's religion. All Things New relies on a spiritual aspect to convey its overall message, and while I'm not by any means the most religious person in the world I found that portion enjoyable. It was very Joan of Arcadia like if you've ever watched that show. 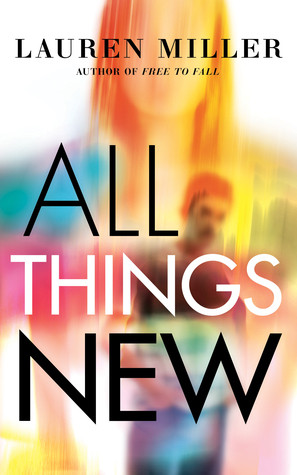 In all, All Things New is a well-written contemporary that I can't suggest highly enough. "A dragon is exactly what it feels like, my panic. Breathing fire in my gut." Jessa Gray was used to hiding her anxiety, pretending to be brave and in control. Her boyfriend Wren was enough for him, didn't make any other real connection except her mother, who didn't know how to deal with her. When an unfortunate accident left her grasping for air and bruised and scarred, her world of pretense and lies crumbled. Unstable, fragile Barbie soon became broken and wounded. "We see what we want to see, what we expect to see, instead of what’s really there. I don’t think we do it on purpose, most of the time. We just get kind of stuck. We start thinking that the way things are is the way they’ll be. But that’s not true. It can’t be true. Because the world is never still." After the accident, Jessa's brain was affected so much, she could no longer picture anything with her mind. Closing her eyes, she couldn't see anything, couldn't even imagine a thing. When she open them, she saw scars on other people's faces, bruises, wounds, disfigurement. In her own terms, she hallucinated. Moving and settling in to her father's place might just be the change she needed to deal with her hallucinations and panic attacks. Jessa met and made new friends with twins, Hannah and Marshall, two distinct personalities, each with his own burden to bear. I totally get why other people didn't seem to get a grasp of the story with the heroine always controlling her emotions and not accepting the reality of her scarred situation. If you would have asked me to read this three years ago, I wouldn't be able to understand anything, too. But after I've read so much about panic attacks and learned about mental disorders from various channels, I finally have better concept of people dealing with this mental and emotional health issues. I'm also glad I was able to read this book during the World Mental Health day a week ago, it even made me more aware of this disorders and helped me understand the depressed even more. I hurt a lot and as much as Jessa did. It may have been painful to see everything with her eyes and not with her mind, but I believed it was even more painful to see everyone's scars right in front of you. I thought she was a strong girl, especially when she finally admitted she needed help, she acknowledged her fears and had joined a group that doesn't judge nor ridicule her imperfections. The depiction of Oscar Wilde's Dorian Gray was a genius idea, perfect and on-point. This book by Lauren Miller was splendidly written and heartbreakingly beautiful. Cut right through my heart, drove it like a race car and plummeted it to a deep ravine. Her harrowing journey to recovery was definitely something to read and think about!